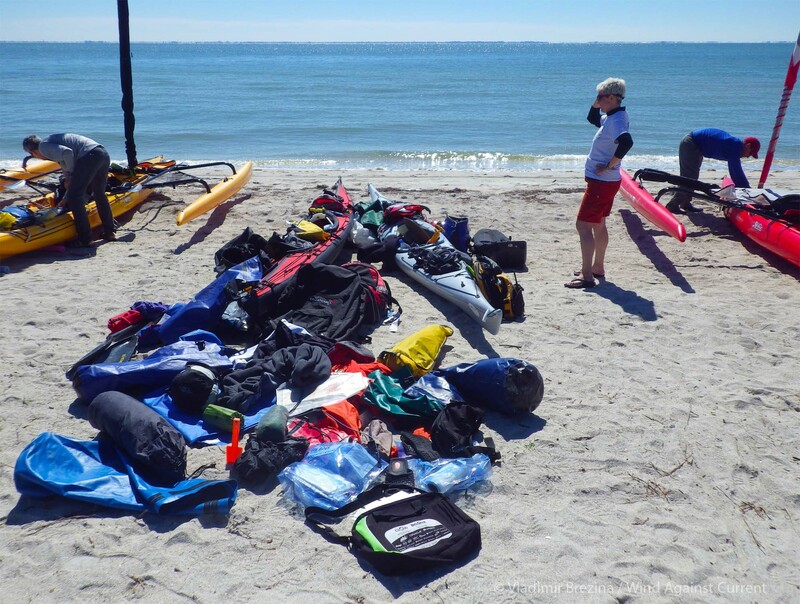 “You should write down what worked, and what didn’t,” DolphinGal advised us when she was doing our gear check the day before the start of the Everglades Challenge. 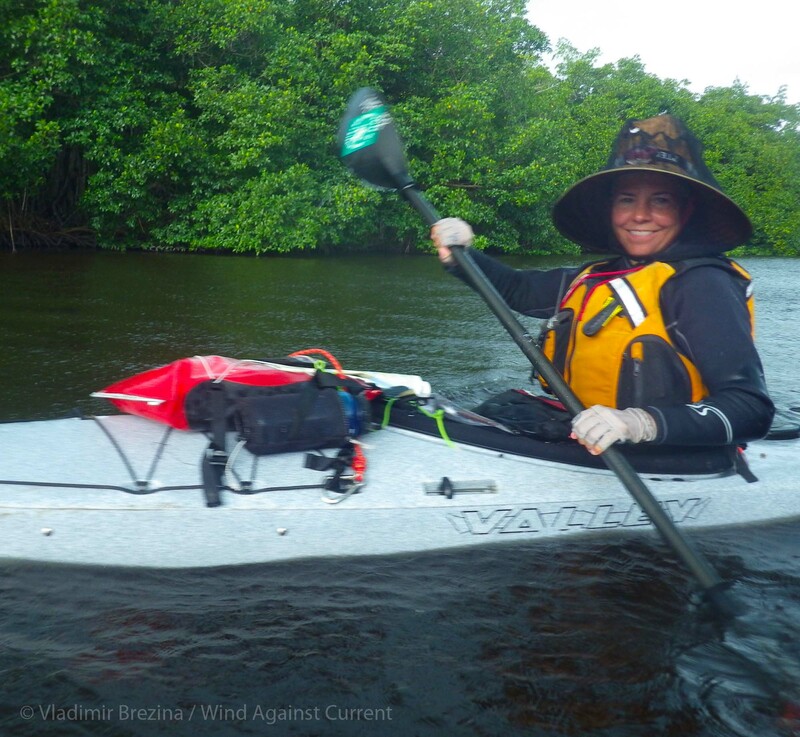 So, a tip of the hat to DolphinGal (who has a pretty impressive story of her own to tell about what worked, and what didn’t, in her Everglades Challenge, some years back). December 2013: How to load the boats from the chickee?? Shakedown trips. We took two “shakedown” trips to prepare for the challenge, one in April and one in December 2013. At the time, we were frustrated because we didn’t seem to be going fast enough—during the challenge, we covered in one day what we’d covered in three or four of our shakedown days. But the slow pace gave us familiarity with the route and the region, which we relied on many times during the challenge. 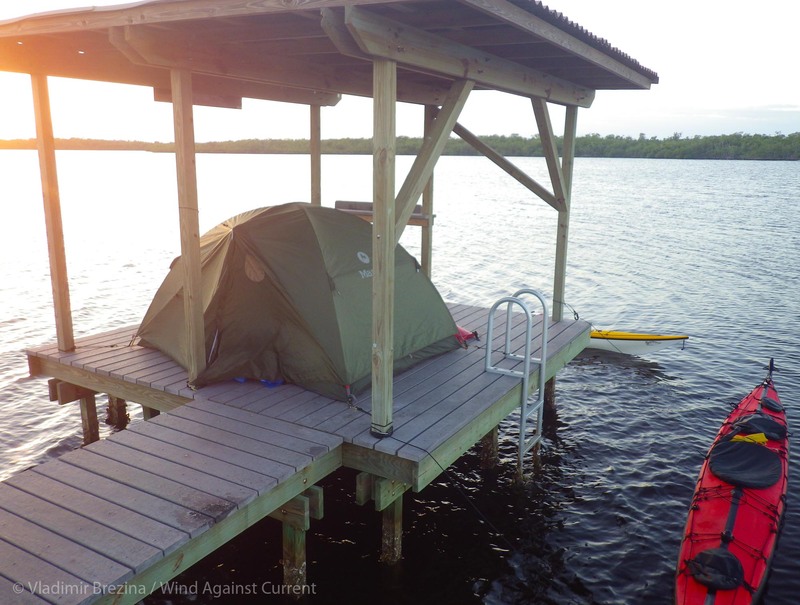 We were particularly thankful during the challenge that we’d learned ahead of time about the joys and frustrations of camping on the Everglades chickees. And that we’d learned how to cope with one of the major Florida hazards—not alligators, but bugs! Pre-race preparation. Johna went on an intensive gym regimen for the six weeks leading up to the race. It helped, a lot. Particularly when it came to carrying the boats and other physical exertion. She also stopped drinking alcohol and caffeine for two weeks before the race, largely to ensure adequate hydration (and because we planned to drink coffee and take caffeine tablets during the race for extra energy, and it only made sense to have as low a caffeine threshold as possible). That was effective. A pre-race manicure.Don’t laugh! Hangnails can be both painful and downright dangerous, if they keep you from grabbing something quickly. And keep in mind that salt water can do a job on cuts and abrasions. Getting a manicure in advance of the trip eliminated jagged cuticles and cut way down on finger damage. Being familiar with navigation. Vlad is a much better navigator than Johna. 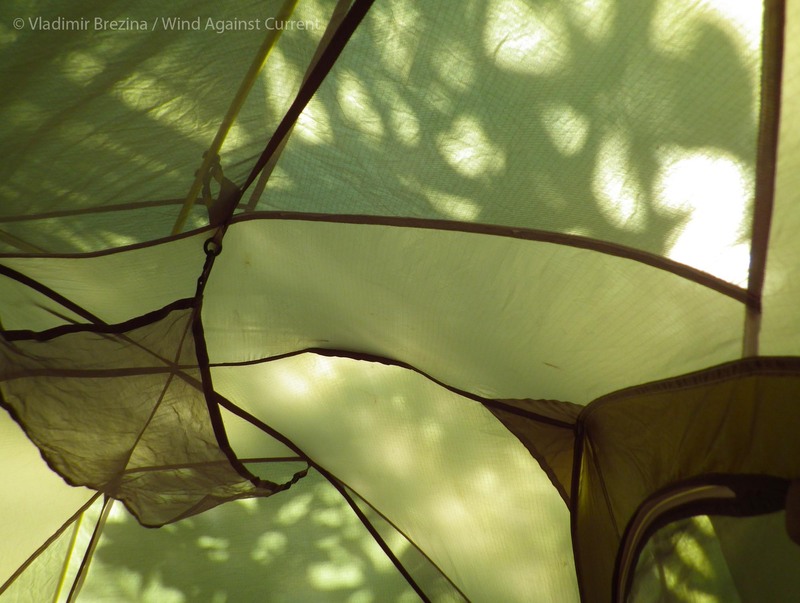 But each of us had charts, a GPS, and a compass—and knew how to use them. Each of us ended up with sole responsibility for navigation at least once, while the other suffered from disorientation. In any case—unlike some others who got lost, even in one legendary case paddling for many miles up the wrong river before realizing it—we made no significant navigational errors during the challenge. Being familiar with tides and currents. 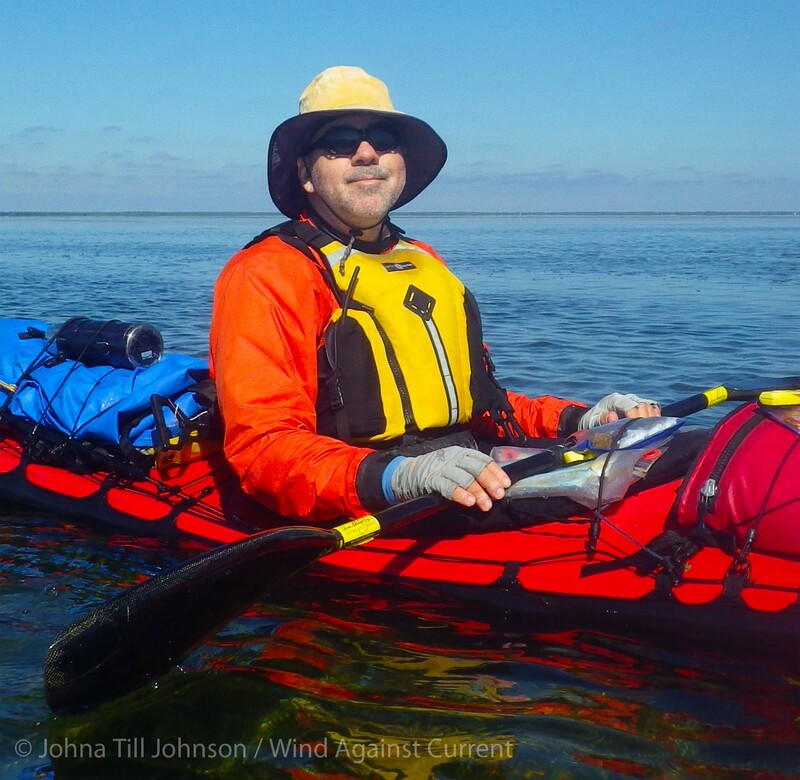 We didn’t have complete insight into Florida tides and currents, partly because they aren’t as well documented as in New York. But we knew enough, and we had a solid understanding of how the tides and currents would affect us—so we knew to rest when the current was against us, and paddle when the current was with us. And we never had to drag our boats across the shallows at low tide, or wait stuck on a mud bank until high tide. That again was in stark contrast to some of the other paddlers, who, due to less experience with saltwater paddling, didn’t plan for the impact of tides and currents. Less food and water. After our shakedown trips, we were a lot less concerned with running out of water. We’d found that we could carry over a week’s supply of water if we needed to. But we didn’t need to, since we also knew exactly where we could fill up. Since there were places to fill up at every checkpoint, we carried just 3 days’ worth of water. We also cut way down on the amount of food we carried. We still had food left at the end, so we still probably carried too much, but it was considerably less than on the previous trips. Witch hazel, for keeping clean and dealing with insect bites and scrapes. Cotton pads soaked in witch hazel served as everything from instant showers to toilet paper, took up very little space, and kept us feeling fresh and soothed from head to toe. Trislide anti-chafing lubricant. This spray-on lubricant is safe for neoprene and protects against chafing. Our underarms, middles, and bottoms really appreciated it! Klymit lightweight sleeping pads. Our friend Chris turned us on to these. They took up considerably less space than our previous sleeping pads, and were just as comfortable. Sun protection. Vlad is very susceptible to sunburn—even in New York, even in winter, even with sunblock, a single day on the water will do it. It was particularly bad, almost disabling, during our 2012 circumnavigation of Long Island. But each successive Florida trip has brought the problem more under control, and now, during the Everglades Challenge, he had no problem at all. Of course, that’s because he’s learned, the hard way, to paddle covered from head to toe, and apply sunscreen often. Particularly valuable have been lightweight sunproof gloves for the hands, which Johna also wears. Unfortunately, they are fingerless gloves, and over a number of days sunburn blisters still form on the backs of the fingertips, making reaching into any confined space such as a drybag very painful. Full-fingered gloves next time? Johna, of course, has her goofy hat that provides plenty of shade—she’s even stopped putting on sunscreen. Bug nets. Absolutely necessary, as we’d learned during the shakedown trips. Combined with our wetsuits and paddle jackets, we had nearly bulletproof bug protection. Except in one instance. Sleeping for several hours in the long grass at Flamingo might not have been such a good idea. After the race Vlad discovered that he was covered in insect bites in places mosquitoes could never have reached… Witch hazel to the rescue! Redundant spares. Johna managed to drop her stash of AA batteries—which powered our GPS, among other devices—into the water on the first night. Fortunately, that was just stash one of three: She had a backup stash, and a backup-backup stash, stored in different waterproof drybags. Similarly, we had a backup GPS (making 3 in total) and multiple backup headlamps. We underestimated the impact of cold. Vlad wished he’d brought a drysuit. 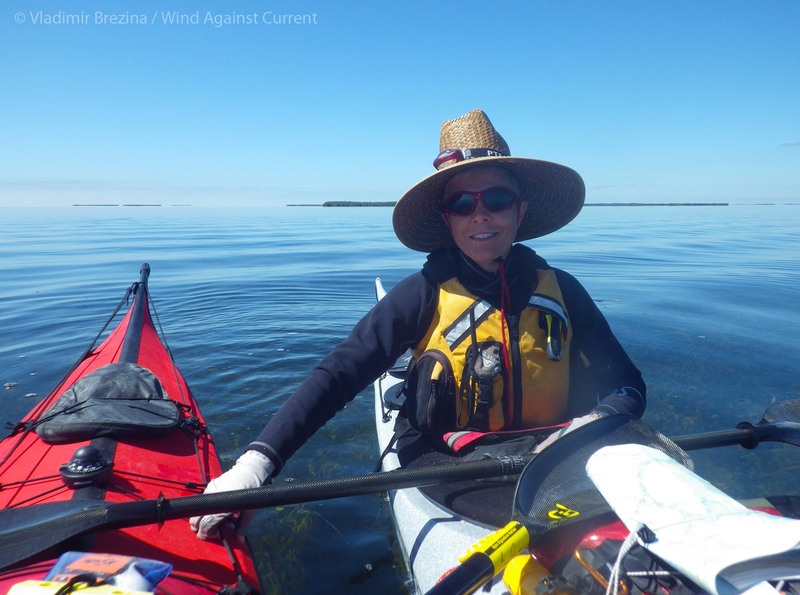 Johna was happy with her wetsuit, but still questions her choice of a sleeping bag liner in place of her 3-season sleeping bag (the liner was way too cold in Tampa, although just right in the ‘Glades). Also, we learned the importance of dressing for cold before we needed to. 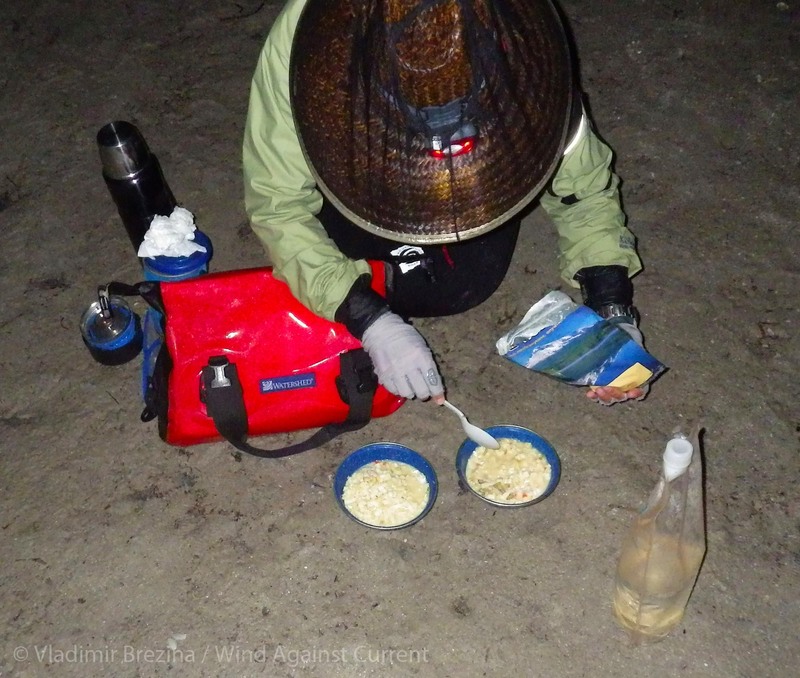 The first night we waited until after dark to put on our gear, and as a result we got very cold—something we compounded by failing to stop and make hot coffee. In subsequent nights, we made a point of putting on our gear before the sun went down. This meant we were occasionally overdressed, but as the old adage has it, it’s much easier to stay warm than to get warm. We underestimated the cumulative impact of sleep deprivation. We’re both good at going without sleep, but by the fifth day it caught up with us with a vengeance. It caused us to slow way down—at some points, we were only making one knot. And it also contributed to hypothermia, particularly in Vlad’s case. In retrospect, we should have planned for at least one more full night’s sleep than we had. As another WaterTriber put it, “When crossing the Everglades, reserve one more chickee than you think you’ll need.” Specifically, in Segment 5 of the race we should have booked the Joe River Chickee, and not counted on making it all the way from Highland Beach to Flamingo, particularly when we knew that a storm front might overtake us. How will it all fit? We both carried too much in our deck bags, too—causing us to waste precious time rooting around for various items. Not everything has to go in the deck bag! Equipment failure. If anyone knows of a truly waterproof headlamp, please let us know. Once again, two of our headlamps failed (Princeton Vizz—good on paper, but not recommended). Ugh! And once again, just like on our shakedown trip in December, Vlad had trouble with his shoes. The Salomon Techamphibian watershoes have sturdy soles, excellent for walking on land and clambering without fear over rocks and oyster bars. But after only a day’s paddling they started to pinch Vlad’s toes, and it got worse day by day as his feet swelled. They also retain sand and bits of shell, which caused agonizing cuts and scrapes. Vlad was forced to take the shoes off in the boat and paddle just in neoprene socks, then struggle to put the shoes on every time we landed. Even though the shoes were new, he left them behind when we left Florida… After two failures with shoes of this kind, he’s going to return to neoprene booties, despite their softer soles, of the kind that Johna wore. In retrospect, our strategy—albeit not exactly the one that we’d intended—was clear. We paddled slowly, but we made up for it by paddling for a long time. “Just keep the boat moving, and you’ll get there” was one piece of advice we’d heard. And it worked for us, this time. 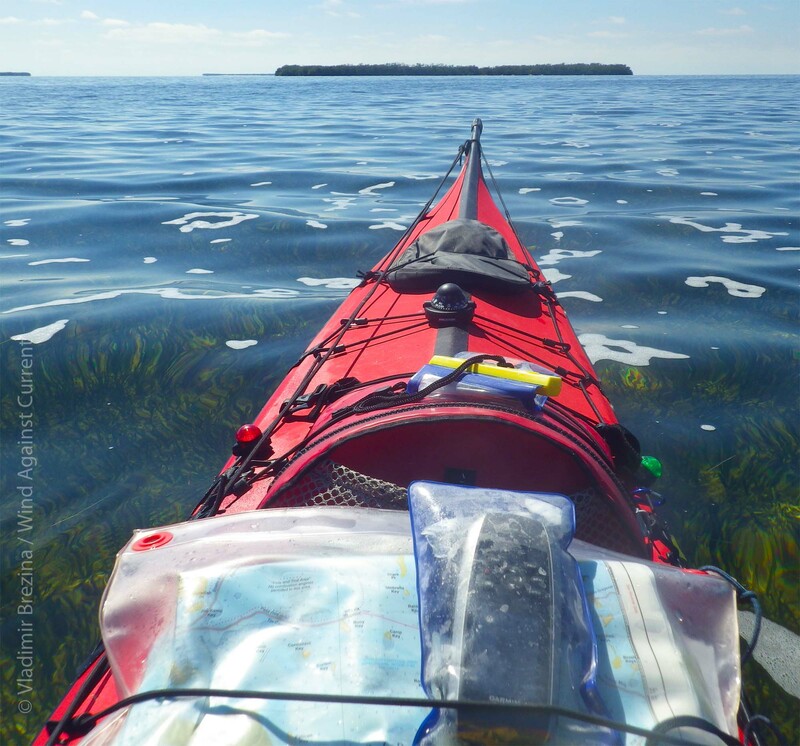 But if we’d paddled a bit faster—if we’d been a bit more fit—we could have paddled less, and slept more. And that would have allowed us to paddle faster the next day… Instead, the opposite happened. We paddled longer and slept less, and so paddled even more slowly, and even longer, the next day. Part of the problem was that we couldn’t do any on-water training for the two months before the race because of ice in New York Harbor. And there are many other fascinating and instructive stories from previous years, and from other WaterTribe challenges, in the Magazine and Discussion Forums on the WaterTribe site. 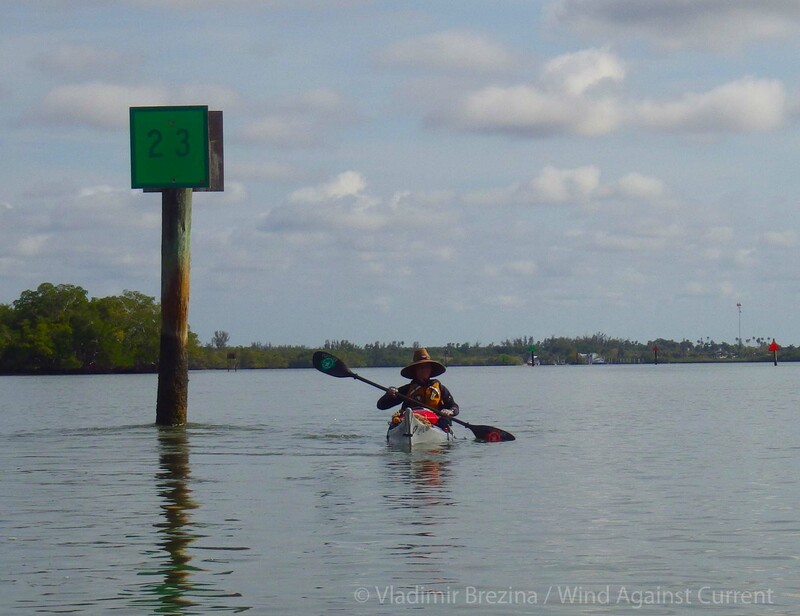 This entry was posted in Kayaking and tagged Everglades, Everglades Challenge, Florida Kayaking, Kayak Equipment, Kayak Expeditions, Kayak Gear, Kayak Race, Kayak Trip Planning, Photography, Sea Kayaking, WaterTribe. Bookmark the permalink. I really like that you made note of the good and bad…has to be helpful!…great post! Well, we *did* get the recommendation to do so—so credit goes to DolphinGal. But thanks for reading, and commenting. Vlad and Johna, For this long time paddler you are an inspiration. The paddling skill required for this speaks for itself. Your dialog is clear and informative, The photographs, spectacular! The gear reviews are great! The insights you share, valuable! Your adventure helped me through a long cold winter. Thanks again! Hoping Jeanie and I run across you on the water this summer. I don’t think so–we might give Black Diamond a try! Thanks for the kind comments, and glad it was helpful. Hope to see you, as well! Mine own dream boat arrived yesterday, a Folbot Kodiak circa 2000-2004. Used, but so far I can’t determine where it was used, maybe a swimming pool… once or twice. It is in immaculate condition, all the bells and whistles, I’m busy customizing it further. I can now dream about trips such as yours! I’ll let Vlad comment further, but as I understand it the Folbot has a long and storied history. Congratulations!! And may you have many happy voyages in it! Congrats again on this amazing accomplishment. I truly devoured every word and am so grateful to have shared the adventure ….well at least virtually. Bravo! Wow, Sue, thank! Very much appreciate your regular posts–thanks for reading! Interesting to read your tips even though I can’t imagine ever doing anything similar. Thanks also for the links to other people’s stories and pix about the challenge, it’s all been a fascinating virtual voyage.LIke the commenter just above I’ve devoured every word. Thanks for reading, and commenting–and glad you checked out the links! It’s been fun :-) Also interesting to check out other people’s experiences. You did really well, and I’m sure there will definitely be a next time. It must have been awful for Vlad to have such uncomfortable shoes. Not much can be worse than pinched toes. 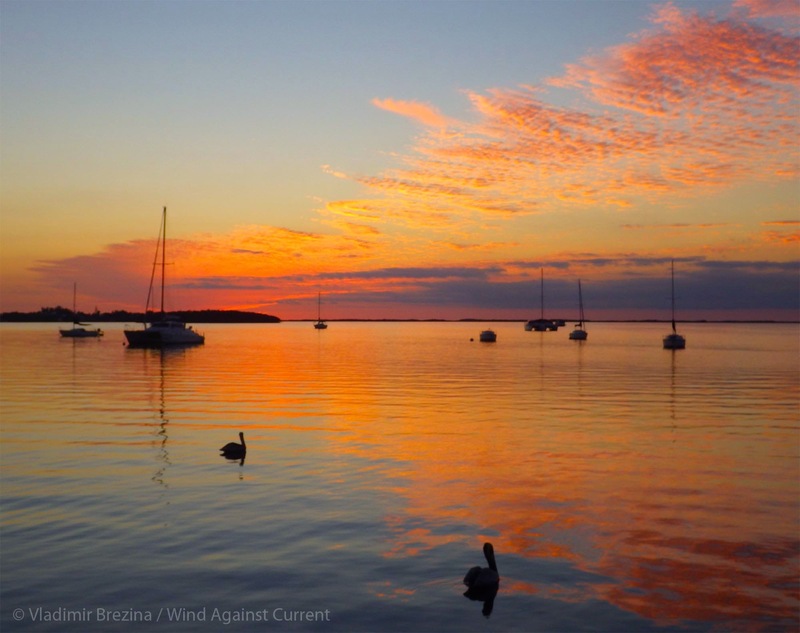 That Key Largo sunset is really awesome. The sunset was even better live :-)! Except for the fact that it meant the race was drawing to an end…. Yes, Vlad’s had ongoing issues with boat shoes. His feet are still recovering, sad to say. Good thing he’s tough! Thanks for reading, and posting. Great read! Enjoyed meeting both of you at the finish. Hope to see you again at a future WaterTribe event. Thanks! And likewise. We’ll be posting the full story shortly to WaterTribe forums–stay tuned for a brief shoutout to you. You may never do this, heck you might not even like the water, but a great read about the things we humans do. Good idea to note down what worked and didn’t – always a handy reference to have. We have DolphinGal to thank for that suggestion… though many of our paddling colleagues have requested it, also. Thanks for reading, and posting. Wow, now there’s an association I hadn’t thought of. 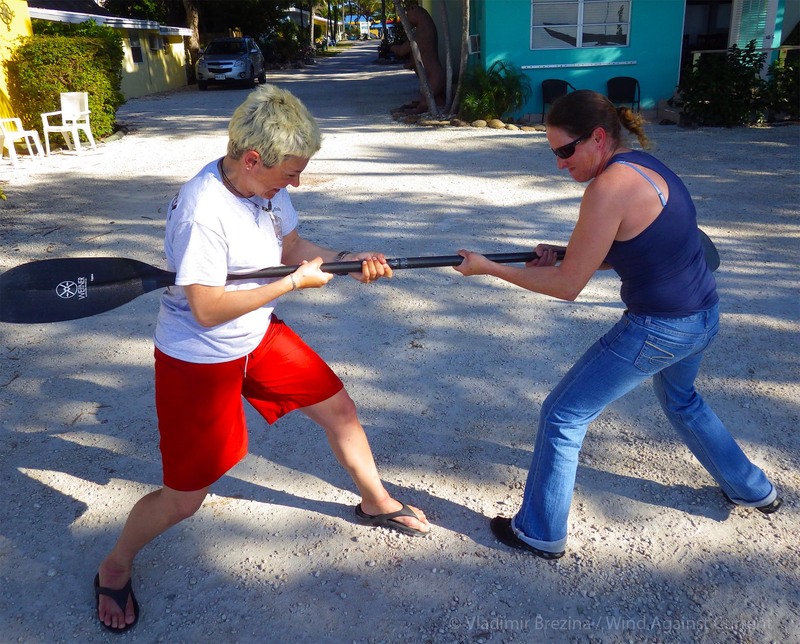 Actually it was pretty amusing–Cynthia is extremely strong, but it took the two of us quite a while to separate the two parts of the paddle, which had been fused together by salt and water. Thanks for the kind words, and for reading and posting! You know, blue, I think it is. We were just talking to a friend about a paddle we’re planning… one question was, “what if we get kicked off our campspot?” And the answer is, as always, “go with the flow”… literally, in some cases. 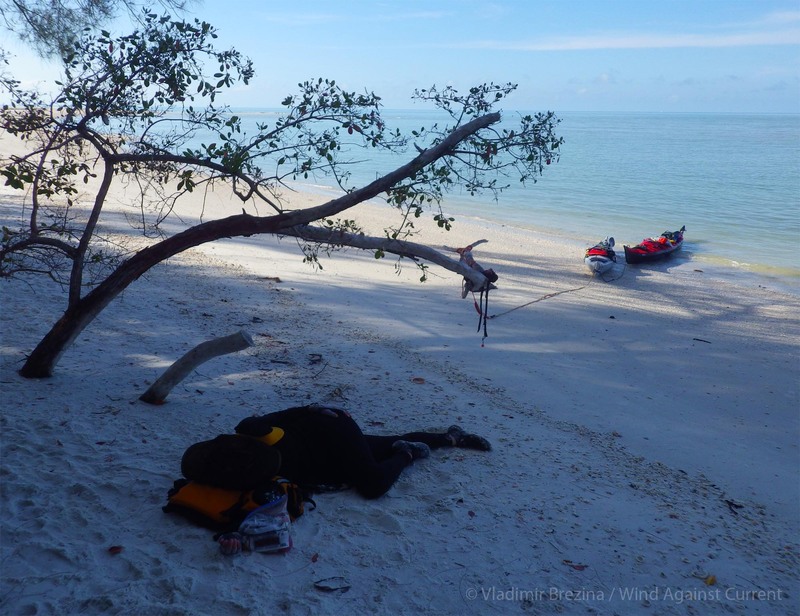 We’d plan to paddle somewhere else and catch a few hours of sleep in the early morning…. as you said, you simply move on from there! As long as we’re being philosophical…. one thing paddling teaches you is not to worry about the past or the future. The only thing that matters is the stroke you’re taking RIGHT NOW…. Why thank you! And thanks for reading all the way through…. Great story with full of tips! Bonus for the sunset. Glad you liked it! Thanks!! Incredible description. I was spellbound from start to finish even though I have never been in a kyak..It was an adventure story in which I participated as a unseen partner. Thank you for that fabulous ride! Thank you so much! Glad to have had you along!! :-) Thank you so much for reading, and commenting!! This was such an interesting read – for a non-paddler who knows absolutely nothing about the sport, I learned a great deal by your format of what worked and what didn’t.